With The Deadliest Milestone complete, I’m optimistic about updating more often. I’ve been thinking a lot about roguelikes lately, for three reasons: 1) they’ve become trendy as hell in the indie scene, 2) I’m not sure I actually like them, which is important because 3) I keep almost making them. I guess we need to establish what a roguelike is (I know, groan, I’ll keep it short). I’m not going to get into the history of Rogue since we all know what that is, besides most roguelikes don’t resemble Rogue at all anymore, and even Rogue wasn’t the game we’re thinking of when we’re talking about the genre- we’re thinking of NetHack. 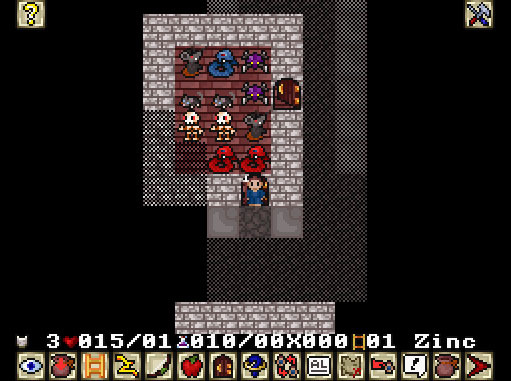 Is this Rogue or NetHack? Hard to tell. If anything, a roguelike is a game with heavily randomized elements that you’re not expected to win on your first outing. They have to be designed in a way that multiple playthroughs allow the player to get further by either learning the systems, unlocking new advantages, or both. Otherwise, the player would be done in a couple hours, never see most of the randomized content and what’s the point of that? Roguelikes are generally difficult, but that’s not a strict requirement, and some games only have minimal resemblance when the genre gets mixed with platformers or action games, sometimes called rogue-lites by people who can’t enjoy a game without categorizing it. Does falling down a well shooting gun-boots count as a roguelite? Technically, yes. In theory, I love roguelikes. The shape of a roguelike is unpredictable, tense, tons of different combinations which make things feel different every time you play it. There’s a compact power curve, so you feel the enjoyment of becoming powerful much more quickly than, say, a traditional rpg. And now that I don’t have as much time for gaming, sitting down for 20 minutes at a time is appealing. 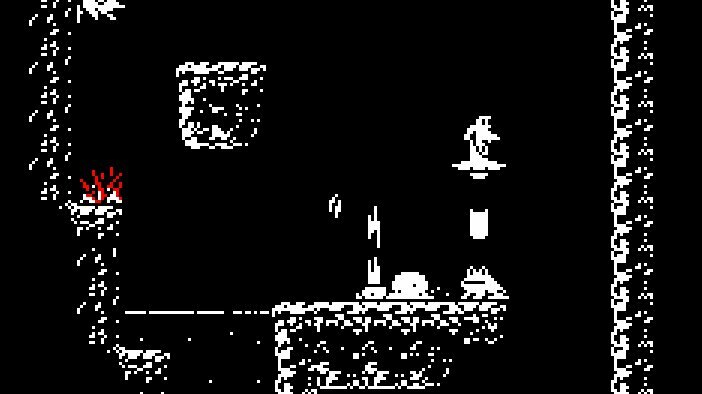 Ultimately, what I like so much about a roguelike is the interesting situations it puts you in, and the feeling that failure is real and not just a reload. FTL feels more like commanding a starship than any other game I can think of, ADOM feels more dangerous than Dark Souls and Darkest Dungeon feels more compelling than Pillars of Eternity. At least to me. So why do I lose interest so quickly? Procedural Death Labyrinth. Yes, this is a real term people were trying to make happen for a while. I’m going to have to go with a capital P for Persistence, which I realize is contradictory to what I just said. As soon as it sinks in that each failed run is wiped from history, everything’s ones and zeros. I’m not saying you shouldn’t enjoy overcoming this sort of challenge, I’m just saying that I can’t convince myself to keep coming back. It feels like playing a board game alone and I keep losing. The problem with persistence is that it usually rides shotgun with story, emergent or otherwise. When each attempt to win the game is wiped out by the next, even an emergent story starts to get muddy to the point where it’s meaningless. By the tenth time I play FTL, I’m barely reading the random quest text anymore, it isn’t real, I just want to know what I’m getting. Again, I don’t begrudge anyone loving FTL, the fact that I like FTL quite a bit is exactly why I start to lose interest when it resets over and over like a space-themed Groundhog Day. 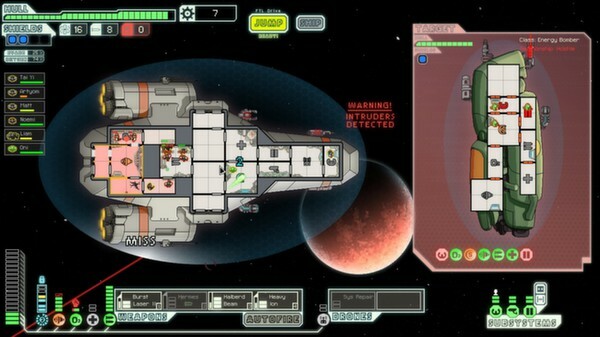 Surely I’m not the only person who wants to be in the FTL universe for longer than one suicide mission? Very early on in The Banner Saga‘s development, we considered roguelike qualities. It was supposed to be a hard march where not everyone made it, with tactical battles that could permanently kill someone. Once we started getting a story throughout, we knew we didn’t want the player to have to start over. We went the opposite angle, in that you almost couldn’t lose the game, but losing a battle had consequences that would cripple you over the long-term. You may finish the game, but at a much greater narrative cost than someone who played well. For Killers and Thieves the question comes up again. I don’t want the player to frequently restart, and we’ve got a story to tell, but this is the kind of procedural game that begs for real gameplay consequences. Roguelike? I don’t know. Lots of new things to talk about next time, though. Click to enlarge! Will Killers and Thieves solve this problem, and do players even want a “solution”? Gamers in general are still loving roguelikes. But I am attempting some kind of merging of ideals. The idea is to have a world that isn’t resetting, and an ongoing story, with characters who respond like they’re in a roguelike, suffering prison sentences, crippling wounds and permanent death, allowing you to hire new characters with random traits, flaws and stats. The story will span a fair number of hours instead of hundreds, but there will be lose conditions, with plenty of opportunity to address the situation before it ends your game. The challenge will be presenting a story that doesn’t suffer if the player restarts, or that the threat of having to start over, though meaningful, doesn’t mean the player is completely doomed. One of the recurring themes in the game I haven’t talked about much is that the decisions are player-initiated. Rarely does the game push you to take an action or play by arbitrary rules: there’s no countdown timer on heists, or infinite waves of guards to force you to flee. You can keep going until you decide you’re done, but the longer you stay, the greater the risk that you’re caught. There’s no random encounters to blindside you when you’re not ready, but you’ll have to decide what you think is an acceptable risk for a mission. Kill as many people as you want on a heist, but guards will swarm the district, making it harder to complete missions or future heists. If your weekly expenses are putting too much pressure on you, cut costs or take a chance on some jobs. Essentially, like running a thieves guild from the shadows, the player decides when to strike, and the world goes on around you while it happens. Will it work or be a confusing mess? We’re still working hard on that question, but I’m feeling good about it. We’ll get to find out in the coming months! I read your post and its I can agree with a majority of the posts. After while, even I don’t care what is happening to a ship being invaded by space pirates after awhile or do I even care about the story any of the Diablo games and I just continually grind through randomized dungeons until I get good loot drops. You said that you wondered if gamers wanted a “solution” to roguelikes, and I say “Why not?” If finding a solution creates a great game. I am all for it. To me, I think there is a good you are asking yourself as a game designer/director, “What some great games are there that I wish had roguelike elements in them?” Because I have found myself wondering this when I have played games too. For instance, take the Metal Gear Solid series. I have played the game a bunch of times. It wasn’t the level design, but after a while I had memorized the routes of the enemy soldiers and everything becomes so mechanical. Then again, after memorizing their routes you can pull off cool tricks or speed run. Whereas, my first play through the room gave me the greatest sense of vulnerability because I had no idea where the soldiers routes were and I had to wait to figure them out or take chances. It’d be nice if it was an option to remix the patrol routes because having pre set routes has its advantages too. But that is just one example. I also sometimes wish popular RPGs did not just take the branched approach to everything and instead throw a surprise path at you instead. Take Mass Effect for example, sure you can play the game several times through and try new dialog options but ultimately every decision has a preset path. It still follows a path along the story tree while not throwing anything different or unexpected at you. It’d be nice to play an RPG with a structured story but still had some elements of surprise. Prolonging the reset of a rogulike game is something I’d like to see as well and may serve as a good solution. 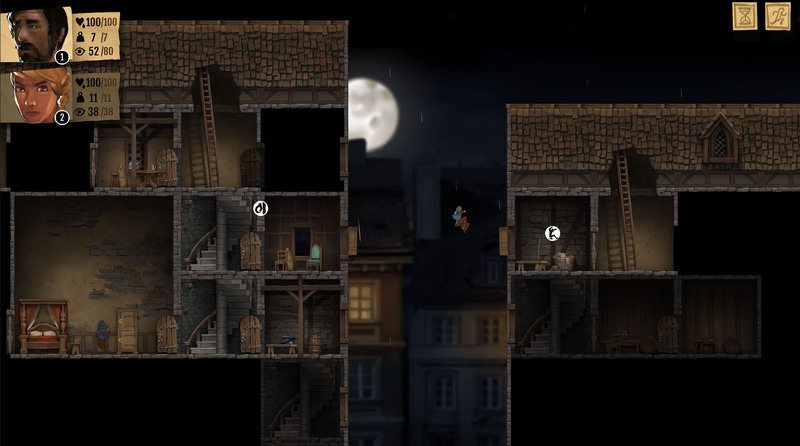 It does feel like life in a roguelike is a little too short. I am not sure if you agree with me or not, but if you can ask yourself what made some of your favorite games and classics so great but find where you’re able to put a roguelike twist to it, it could help you brainstorm some ideas for your game.